Been looking for a great Multiclass frontliner in Pathfinder Kingmaker? 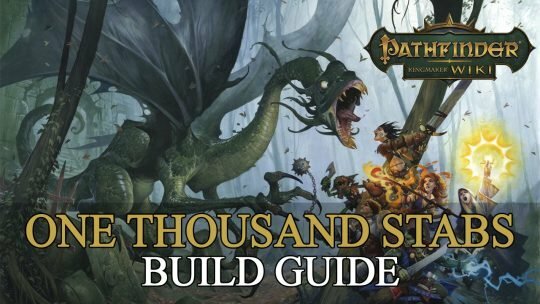 Check out the One Thousand Stabs Build! Fallout 76 Beginner Guide covering tips, tricks, explaining mechanics and giving you an overview of what to look out for when leaving Vault 76! Fallout 76 Best Perks Guide – showcasing the best picks for each S.P.E.C.I.A.L stat, of course thinking about Builds including your Weapons, Armor and objectives. In this Pathfinder Kingmaker Build Guide we show you how to multiclass Regongar into a Dragon Disciple! In this Pathfinder Build Guide we show you how to make Jubilost into a ranged damage dealer that uses bombs to blow up enemies! In this Pathfinder Kingmaker Guide we show you how to get the most from Harrim the Cleric! In this Pathfinder Kingmaker Build Guide we’ll show you how to get the most out of Linzi the Bard! Amiri the Barbarian is a medium-armor DPS build for Pathfinder: Kingmaker that will rage through the battlefield and annihilate those in her path. Build an Arcane Trickster Octavia to stack sneak and spell damage and decimate your enemies from the shadows in this Pathfinder Kingmaker Build.